Ed Zotti is a long-time journalist and editor of the syndicated "Straight Dope" newspaper column by Cecil Adams -- a name that is most likely a pseudonym. Cecil Adams is a name, possibly a pseudonym, designating the American author of The Straight Dope, a popular question and answer column published in The Chicago Reader since 1973. 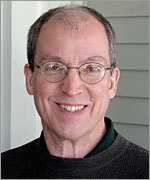 Ed Zotti is Adams' editor. Cecil Adams is currently considered a "single author." If one or more works are by a distinct, homonymous authors, go ahead and split the author. Cecil Adams is composed of 2 names. You can examine and separate out names.